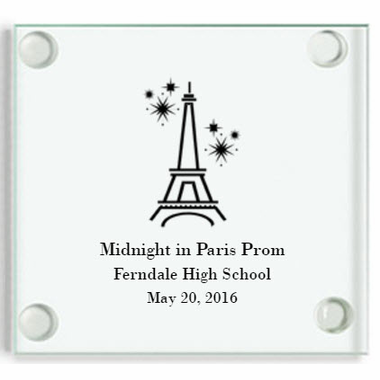 As the guests at your Paris theme prom head home, gift them an elegant French-inspired party favor fully customized for the special event. 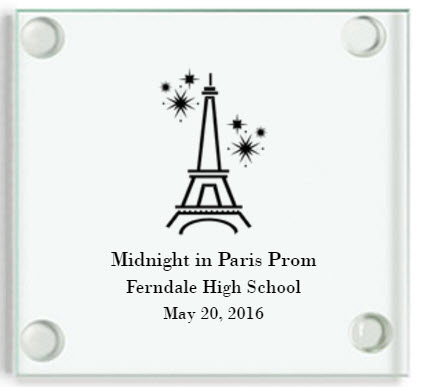 These glass coasters with a Parisian design that is directly silk-screen printed will impress one and all. Choose the optional white favor boxes that can be ordered for $.50 each and easily assembled. For the final touch, add a peel and stick bow and your classic party favor, complete with French flair, is ready to hand out. Each square glass coaster measures 3.5 inches and has rubber feet so it won't slip. Coasters are not in individual boxes; they come bulk packed.